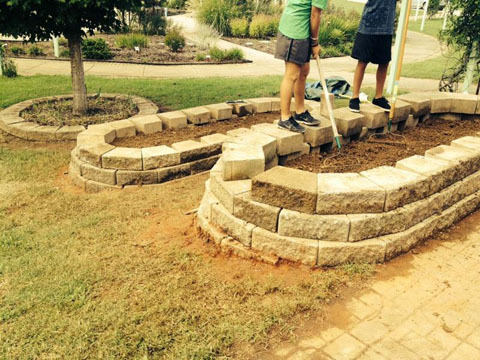 This project is a joint venture between the Williamson County Master Gardeners Association and members of the local Lions Clubs. The garden will feature plantings which call attention to the five senses - taste, smell, touch, hearing and sight. The organizations are working cooperatively with the Williamson County Parks and Recreation Department. The Garden is located at Grassland Park, near Manley Lane and Hillsboro Road. 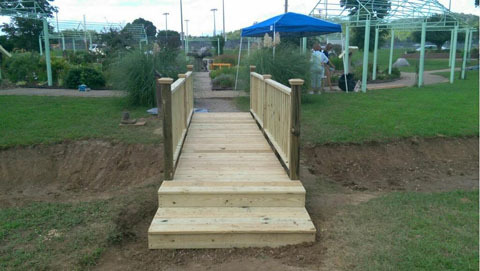 Eagle Scout Candidate Joey Rosen from Troop 13 led the construction project for this bridge at Sensory Garden for the Blind. This program enables Lions Club Members to work with Boy Scouts and Girl Scouts on a quarterly basis on their goal of meeting the requirements to obtain Merit Badges. Volunteers can find out more information by visiting the website http://meritbadge.org/wiki/index.php/Merit_Badges which describes Merit Badges and the requirements for each one. Volunteers will need to also fill out an Adult Application which can be located at http://mtcbsa.org/assets/forms/AdultApplication.pdf as well as a Merit Badge Counselor Information sheet which can be located at http://www.mtcbsa.org/assets/forms/MeritBadgeCounselorApplication.pdf. These forms should be sent to Lion Chuck Wells for processing. One of the projects for our Lions Club is to provide drop boxes for people to donate their used eyeglasses so that we can work toward our mission of providing vision for all. Click here for our eyeglass recycling locations. Saddle Up! is an therapeutic equine riding program in Williamson County for children with disabilities from ages 4 to 18. This non-profit organization has two major fundraisers each year and our club helps by providing volunteers to help set up and operate these fundraisers. Each year, Lions clubs around the world proudly sponsor the Lions International Peace Poster Contest in local schools and youth groups. This contest encourages young people worldwide to artistically express their vision of peace. Students, ages 11, 12 or 13 on November 15 are eligilbe to participate. Jordynn Placentia being presented with an award from Williamson County Lions Club for her submission in the 2012 Peace Poster Contest. Pictured with Jordynn are Lions Chuck Wells, Becky Mason and President Chuck Neighbors. 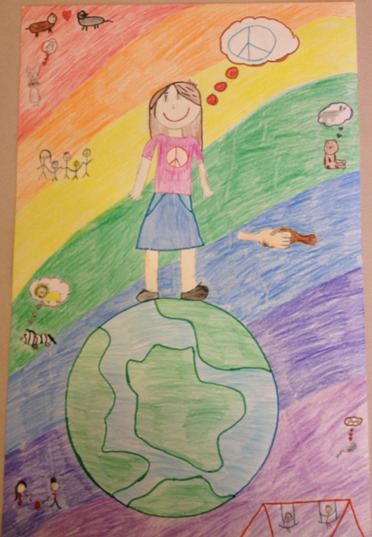 Jordynn Placentia's entry for the 2012 Peace Poster Contest. Jaycie Bellamy an 11 year old from College Grove and Girl Scout Troop #1769 drew a Peace Poster named "Sunset on Peace" for the 2011 Peace Poster Contest. Lion Diane Crowell Adams presents Jaycie Bellamy with an award from the Williamson County Lions Club for her winning entry in the 2011 Peace Poster Contest. When Elaine McClellan spoke to the Williamson County Lions Club telling about her book, “Gimpys Secret,” the story of a physically challenged chicken that taught a little girl the universal truths in learning how to love, it started a process that resulted in bringing four copies of the book in Braille to the Tennessee School for the Blind library. The Williamson County club contacted school Superintendent, Lion Jim Oldham, and facilitated with Mrs. McClellan the project to get the book transcribed into Braille for the students. This is the first Braille printing, but the necessary electronic codes can be available to other institutions for the blind or sight impaired. Author Elaine McClellan watches Superintendent Lion Jim Oldham placing the first of 4 copies of “Gimpys Secret” in the TSB Library in Nashville. 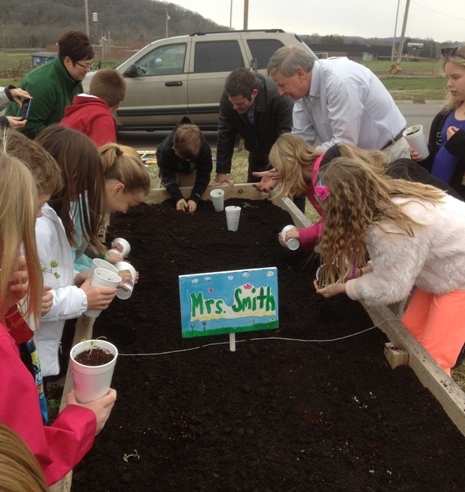 Lion Chuck Wells assists Grassland Elementary School Students plant their vegetables while Lions Becky Mason and John Miller look on. 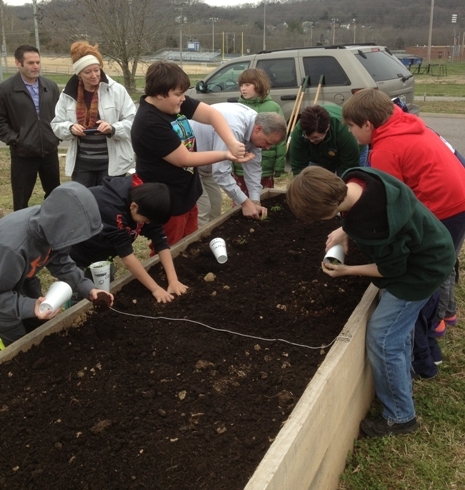 Lions John Miller and Chuck Wells assist Grassland Elementary School Students plant their vegetables. 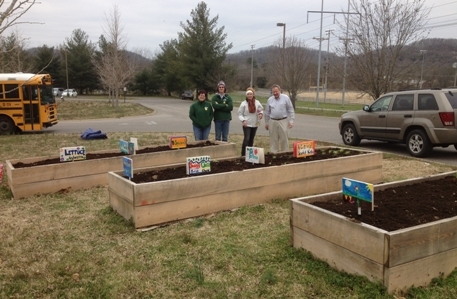 Williamson County Lions Chuck Wells and Becky Mason along with Grassland Elementary PTO Members by the completed vegetable planters.